Villa Polidori is an island escape where you can be at one with nature, sitting on the balcony overlooking the sea with only the sounds of the waves slowly melting into the shore. Villa Polidori is an island escape where you can be at one with nature, sitting on the balcony overlooking the sea with only the sounds of the waves slowly melting into the shore, the birds sweetly chirping and the gentle coastal breeze rustling the hillside flora. Inside the villa has a modern and airy feel, but maintains a distinctive character through original features like the arched windows, and the large stone fireplace in the living/dining area. Quaint private garden terraces and paved dining areas reach from the house across the foothills of Punto Caruso nature park, and lead down to your own private beach access. The simplistic elegance of this villa will smoothly ease you into forgetting the stresses and toils of everyday life, surrounded by nothing but 4000 square meters of lush Campania coast countryside. Recently fully renovated, the building has an area of approximately 120 square metres and is spread over two levels. At ground level, there is a living area with a sofa corner and a dining area, a double bedroom, a bathroom with shower, the kitchen, a veranda, barbecue area and a small garden. There is a second bedroom on an open mezzanine which is accessed from the living area, together with a separate bathroom and shower. The villa is situated on the extremity West side of Ischia island in a park nature reserve called Punta Caruso Park, , where nearby we have the Negombo Thermal Gardens,on the beach of Sant. Montano Bay and the Mortella Botanic Gardens. It is also nearby Forio city centre and Lacco Ameno town. 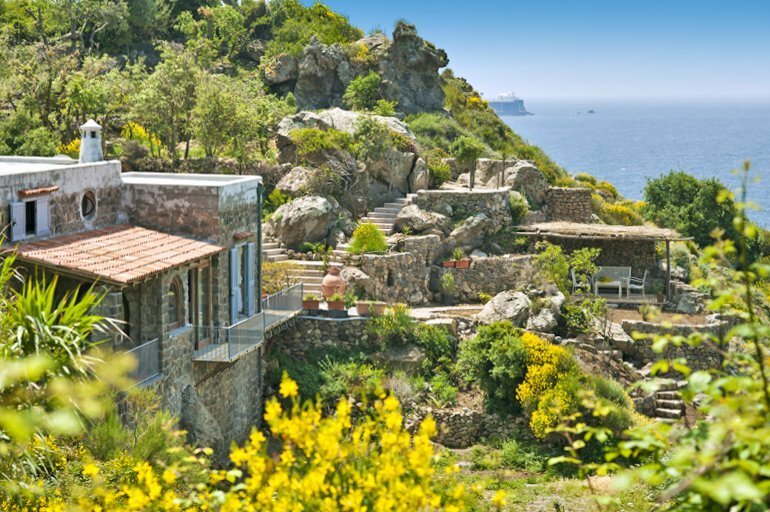 The villa is situated in Punta Caruso nature park on the volcanic island of Ischia, off the coast of Naples in the Tyrrhenian Sea. The natural volcanic activity mean the main attractions on island are the hot springs and volcanic mud. Nearby are the glorious Negombo Thermal Gardens, a thermal water park situated in the beautiful corner of Ischia known as San Montano Bay in Lacco Ameno. There are twelve different types of swimming pools and baths to choose from, each heated to a different temperature, and also a Japanese Labyrinth Bath to improve circulation. The Mortella Botanic Gardens are an unmissable paradise of exotic flora, linked together with walkways and stairs, offering gorgeous views over the bay of Forio. The villa is also close to the picturesque town of Forio, with all shops and amenities, and much of the islands prettiest architecture. A chef can be brought in to serve a special lunch or romantic dinner for €120. Daily cleaning can be arranged at €200 per week. A 4x4 car can be rented for €350 per week. Return airport transfer for two people from Capodichino, including ferry crossing and insurance, costs €160.